When singer Carrie Underwood and husband hockey player Mike Fisher got engaged in 2009, Carrie's engagement ring caused a stir. Carrie's yellow diamond ring was refreshingly different than many recent celebrity engagement ring trends. Carrie Underwood and Ottawa Senators player Mike Fisher were set up on a blind date by friends after a concert in October 2008. According to US Magazine, Underwood was nervous about the matchmaking so they met in a group for their first meeting. Fisher and Underwood hit it off and were engaged a year later. Celebrities spend a lot of time in the public spotlight and keeping an engagement private can be difficult. Fisher managed to keep this special moment private by proposing to Underwood at his parent's home. Family marriage proposals can be very moving to couples because they highlight the fact that two families are joining together as one. The proposal may have been private but engagement news soon leaked when a friend of the family congratulated the couple on Fisher's Twitter page, and then fans began the hunt to see the first pictures of Underwood's engagement ring. After a long line of celebrities wearing elaborate white diamond three-stone ring designs, Underwood emerged with a fancy colored diamond with a vintage feel. Fisher gave Underwood a five carat round, brilliant cut yellow diamond encircled by micro-pave white diamonds in a cluster setting in a platinum band. The Diamond Information Center estimates that the ring is worth more than $150,000, with some jewelry experts estimating closer to one million. According to the Popeater site, diamond expert David Mamane believes Underwood's yellow diamond center stone rates VVS1 on the diamond clarity scale, and has an F color grade. Her choice of a platinum band is in keeping with popular celebrity current trends. It is also a smart choice to set off the yellow diamond to best advantage. More celebrities are considering fancy colored diamonds. Celebrity jewelry designer Johnathon Arndt designed Underwood's engagement ring. She is a fan of Arndt's work, and she isn't alone. Elton John, Steven Spielberg, Celine Dion, Keith Urban, Miranda Lambert and Reba McIntyre are some of Arndt's celebrity clients. Arndt is known for creating artistic designs with both a vintage and edgy feel. Replica rings are a great way to get a celebrity fashion look for considerably less money. 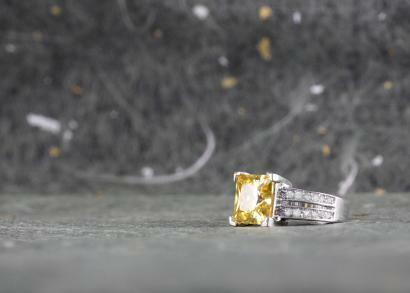 Underwood fans and anyone who likes the look of yellow diamonds can find replicas of her famous engagement ring. Celebrity replica jewelry often uses cubic zirconia in place of diamonds. The following two online retailers have replicas of Underwood's ring. Emitations: Emitations sells a cubic zirconia and sterling silver replica ring of Underwood's engagement ring for $60. Fantasy Jewelry Box: The site offers a version of Underwood's ring with a cubic zirconia in sterling silver for around $50. Today Fisher and Underwood are happily married but her ring is still a subject of fascination for the couple's fans and jewelry collectors. The yellow diamond cluster ring has inspired many brides to consider fancy colored diamond engagement rings.